Background: Due to its wide band gap, high exciton binding energy and high breakdown strength, the nanostructures of ZnO may find applications for electronic, photonic devices, and highfrequency applications. Objective: The aim of the present work is to study electrical transport of thin film composed of a-ZnO nanorods. Method: Physical vapour condensation method was employed to fabricate the nanorods of ZnO. The morphology of these nanorods was investigated with the help of scanning electron microscope. X-ray diffraction pattern of as-prepared thin film was recorded using X-ray diffractometer. For dc conductivity measurements, four-probe method was used. Result: The as-prepared ZnO nanorods have diameter ranging from 10-20 nm and the length is of order of few hundred nanometers. XRD pattern of film composed of ZnO nanorods suggests the amorphous nature. Temperature dependence of dc conductivity has been studied over the temperature range of (297- 4.2K). For the temperature range of 297-120K, Mott’s three dimensional variable range hopping (VRH) is applied to explain the electrical conduction. For lower temperature range (120 - 4.2K), 2Dvariable- range hopping in localized states near the Fermi level may be responsible for the transport of carriers. Conclusion: Variable range hopping mechanism (VRH) has been suggested for the entire temperature range (298-4.2K) on the basis of temperature dependence of dc conductivity data, which changes from 3D to 2D on moving to lower temperatures side (below 125K). Keywords: ZnO nanorods, physical vapour condensation technique, electrical conduction mechanism, variable range hopping, Mott’s parameters, XRD, SEM. 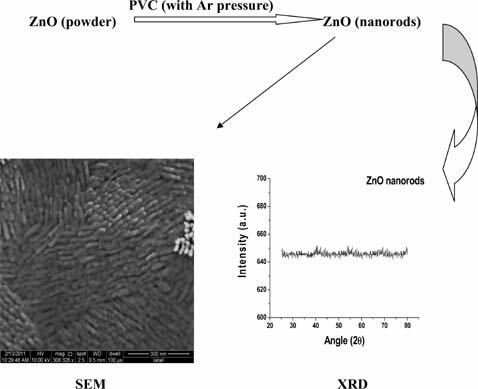 Keywords:ZnO nanorods, physical vapour condensation technique, electrical conduction mechanism, variable range hopping, Mott’s parameters, XRD, SEM. Abstract:Background: Due to its wide band gap, high exciton binding energy and high breakdown strength, the nanostructures of ZnO may find applications for electronic, photonic devices, and highfrequency applications.